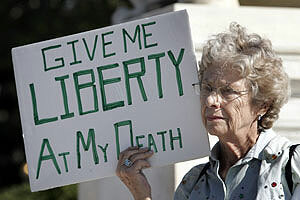 The freedom to die in peace has been much in the news of late. When an 83-year-old man shot first his dying wife and then himself in a Pennsylvania hospice, distressed commenters speculated that local law left him with no better options. The wife was bedridden, in a unit for people who have less than six months to live, and Pennsylvania has no Death with Dignity provisions like those in Washington and Oregon. Washington’s Dignity Act was championed by former Gov. Booth Gardner, who himself died last month after a protracted fight with Parkinson’s disease. Several years ago, I hosted a small gathering in which the former governor struggled, through the debilitating veil of his illness, to explain why the issue was so important to him. His struggle said more than his words ever could. The legal rights Gov. Gardner championed are in place in Olympia, and a new Seattle Cancer Care Alliance study shows that the state’s Dignity Act is an option that can work well for patients and physicians. But recent events make it clear that the battle is far from over. When it comes to the question of dying, the simple answer, and the one we received from our ancestors, is that a chance at life, no matter how degraded or brief, is always the better than the alternative. That is the default assumption of most administrators and care providers, and it is encoded in law and religion. Early in March, when a California nurse refused to perform CPR on a dying 87-year-old, her decision created a national firestorm. A California geriatrics expert said she would override facility policy “rather than watch somebody die in front of me,” despite admitting in the same interview that “the survival odds are slim among elderly who receive CPR. Even if they survive, they are never the same.” The Washington State Health Care Association hastened to assure that nothing “like that” could happen in local facilities, and Vice president Wendy Gardner at Merrill Gardens, which runs 24 care centers across the state, told the Seattle Times, “We always start CPR.” I made a note to self: Tell the kids to ship me out of state when my time is getting close, to someplace not called Merrill Gardens. According to her family, the 87-year-old woman denied CPR had her own end of life wishes and wanted to die without intervention. “Our family knows that mom had full knowledge of the limitations of Glenwood Gardens and is at peace,” the family said. Unlike the original headline, We Always Start CPR, the follow-up, Family Backs Facility, was buried on Page Two of the Seattle Times. When it comes time to die, patient preferences all too often are second page news. Two years ago, I scheduled a routine colonoscopy through Seattle’s Polyclinic and was horrified when the pre-operative paperwork informed me that the Polyclinic does not honor patients’ end of life directives. The staff explained that this is because they are an outpatient surgery facility. “Are you saying that your status obligates you to violate my wishes or allows you to violate my wishes?” I asked. They couldn’t say. Time was short, and I went through with the procedure but started transitioning my care away from the clinic. If there is one thing that is absolute for me it is this: my body is my own. People often assume that — in contrast to the finality of death — a decision to start life-prolonging measures is reversible. But the reality is not so simple. In 2011, my mentally ill sister in Phoenix jumped off of a freeway bridge, fell 40 feet, and lived. It was perhaps her 12th suicide attempt, perhaps her 15th, clearly the most lethal. As she lay in the hospital hooked up to a ventilator and tangle of tubes, my family explored what our options were in the event that her body and brain were too broken for a real recovery. There were none. Once life-sustaining treatments had been started — the ventilation, the intravenous drip, the tube feeding — to remove them was considered active euthanasia. No surgery could be done even to relieve her pain without a Do-Not-Resuscitate order being removed. I found myself thinking about Terri Schiavo. Despite the 2008 Death With Dignity Act, Washington residents may be at a greater risk than ever of losing the ability to manage our own dying process or that of loved ones. Legal rights mean little when caretakers “always start CPR.” They mean even less when caretakers believe they serve a higher authority. Washington state is poised for the dubious distinction of becoming the national leader in Catholic control of hospital facilities. The affiliation between Swedish (once proudly secular and now seemingly only nominally so) and the Catholic care system Providence has received the most press. But in 2012, 10 other mergers with Catholic institutions were underway in Washington state. Three Catholic health systems, Providence, PeaceHealth and Franciscan, are now among the region’s largest. Across the country, mergers between secular and Catholic facilities almost invariably result in the United States Conference of Catholic Bishops’ directives being imposed on the whole system, though the change may be gradual. Once a patient enters their care, theology, rather than science, decides what range of services will be offered. Even secular providers treating secular patients are compelled to deny certain treatment options to pregnant or dying patients. The tragic case of Savita Halappanavar, who died in Catholic Ireland last fall after being denied an abortion, is a graphic testimony to what happens when faith trumps science in medical care. And if you think what happened to Halappanavar can’t happen here, you are wrong. In 2010 an Arizona nun was excommunicated for allowing a mother of three to terminate a pregnancy that was killing her. Just as Catholic theology fails during pregnancy to distinguish the value of a mother’s life from that of a dime-sized gestational sac, so it fails at the end of life to distinguish healthy personhood from an existence that offers no hope of anything but life support and suffering unto death. The bishops and many other believers think they know God’s will, and they are so confident that they are willing to impose their beliefs on the rest of us. Katha’s nurse was sure enough that he was willing to further traumatize a possibly dying patient. He knew what his god wanted. But whose god decides? My sister believes in hell, but she doesn’t believe that suicide lands you there. I believe in neither gods nor hell and am willing to take my chances. Whose values and conscience matter? Who gets to make the most important decisions any of us can make — whether and when to bring a new life into this world, when and how to leave it? 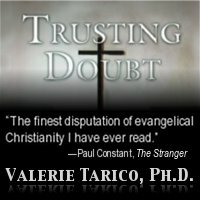 Gallery | This entry was posted in Christianity in the Public Square, Musings & Rants: Life, Parenting, Relationships and tagged Bishops' Directives, death with dignity, patient rights, right to die, U.S. Catholic Council of Bishops. Bookmark the permalink. I was very angry to read that an ICU nurse said something like that to you. Even when I was a believer, taking care of patients in the ICU, I would have never made a comment like that to a family member who was trying to cope with a very sick loved one. I will say that at the hospital I trained at, that we always tried to follow advanced directives when they were available. Sadly, many, many people did not have their wishes known because they had not filled out the paper work. It is better now, as more doctors counsel their patients on this issue (especially here in Oregon), but it is very disconcerting to hear that there are facilities that just ignore the expressed wishes of a person. I makes me want to research the position of the hospital that my PCP is affiliated with. What was craziest about that incident was that it was at a public hospital. At Maricopa County’s tertiery care facility. Crazy, maybe, but not surprising. It is AZ, after all, another Mormon state. I’m sorry to hear about your sister, Valerie. I just wish my own family was as understanding about my struggles with mental illness as you are with your sister. Those struggles have caused me to be alienated not just from my family, but from society in general. I am an outlier, an outsider, a misfit, a pariah, an outcast, an alienated man. Oh, Perry. Mental illness is the worst! I wish more people understood. I’m so sorry you had to bear with religious idiocy atop your sister’s sufferings. About 20 years ago I was diagnosed as bipolar; I also have SLE, or lupus. Oddly, though, after leaving the Mormon church and the emotionally abusive Mormon husband, I am taking the lowest dose possible of the drug to control the manic phase. I don’t think I’m bipolar at all, I believe it was situational. In the past two years my life has been happy beyond anything I imagined. I’ve always said, much to the horror of most of my family and friends, that when the bipolar or lupus become too unbearable I’m going to my son’s in Oregon and get euthanized. Gasp! I’ll go to hell! Hell happens right here on earth if you’re not careful.